This Brand new beautiful condo is in the new development in Ocean Shores called Oyhut Bay 4 miles south of downtown. It's called Outlook 202. Oyhut Bay has bike, moped, and Canoe rentals. This room is on the Second floor , there is an elevator. The master bedroom has a king size bed, the attached master bath has double sinks and a shower. The 2nd bedroom has a queen size bed. The main bathroom has a tub/shower combo.This condo is located in the new development, Oyhut Bay. 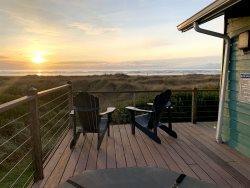 Located approximately 4 miles from downtown Ocean Shores, this community offers many activities such as bike, moped and kayak rentals in the summer as well as a playground and fire pit for year round fun. You can bring your own kayak to explore the miles of canals throughout the area. Recently opened is the Oyhut Bay Bistro as well as The Loft Martini Bar. Damon Point park is a 10 minute walk for great beach combing, kite flying and tide pool exploring. NO SMOKING- DOGS OK a extra fees apply. Exellent communication, overall great experience! We had a great stay and would stay again with them. Beautiful condo! Loved the layout! The furniture was very comfortable. We felt right at home! We were welcomed on our arrival and the check in process was seamless. Check out was a piece of cake - no issues. The property was very clean and well maintained. The beds were very comfortable and there were plenty of dishes, utensils, etc. for our needs. Some beach towels would have been appreciated, but not necessary. Booked through Airbnb for a quick business trip - super easy experience and very luxurious! Simple check in and wonderful stay. Thanks all! My check-in was quick and easy and when we left I left the keys in the unit. The unit was more than expected and we were very pleased with everything. The kitchen was just fantastic with every item you would need to make a gourmet dinner. Bedrooms were large and beds firm and I got a good rest. Will gladly mention the units to friends and family and will again be back myself. Contact At The Beach Rentals Inc.
881 Point Brown Ave N. W.